A little over a week ago, Chuy’s back flared up again after a walk around the neighborhood. We’ve been dealing with his compressed disc flare ups (otherwise known as IVDD or Intervertebral Disc Disease) for the past two years. The vet has told us that the flare ups are totally unpredictable and this is something we have to learn to manage for the rest of Chuy’s life. Luckily, as of right now he’s doing great! We have a tall bed so I noticed that most of the ramps for sale were either too short or too expensive. My husband was determined to make one himself and of course I wanted to share with you how we did it. 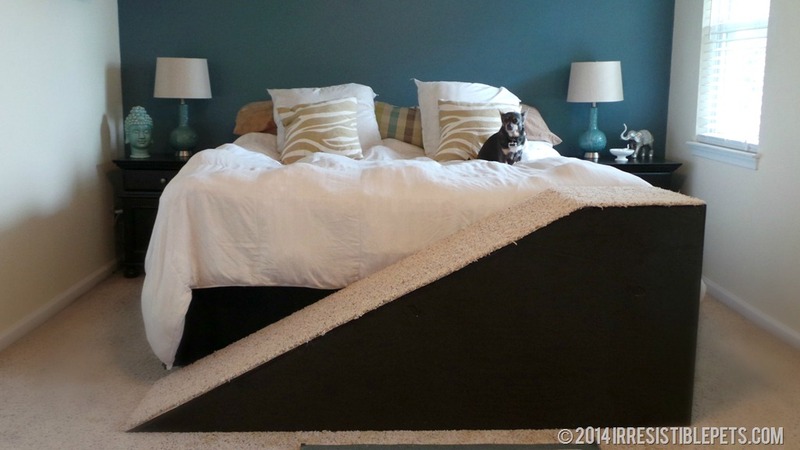 The sizes in this tutorial are specific to our bed so it might be a little different for you. However, the general directions should be about the same. This project took us about 4 hours from start to finish and cost around $60 for the supplies. We already had most of the tools in the supply list so keep that in mind when budgeting! That was quite a savings considering the ramp I saw online that I really wanted was around $400! Before you head to the store, start by measuring your bed to determine how much wood you’ll need. 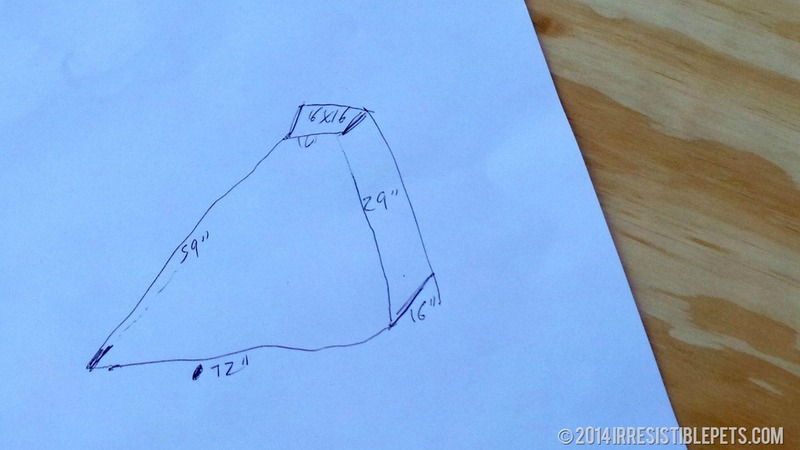 Once we measured the bed, my husband sketched out how the ramp would look with this fancy blueprint! 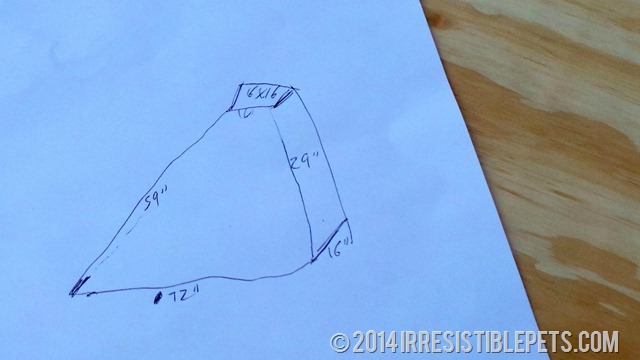 After we measured and sketched out the design, we headed to Home Depot to pick up the supplies we needed. 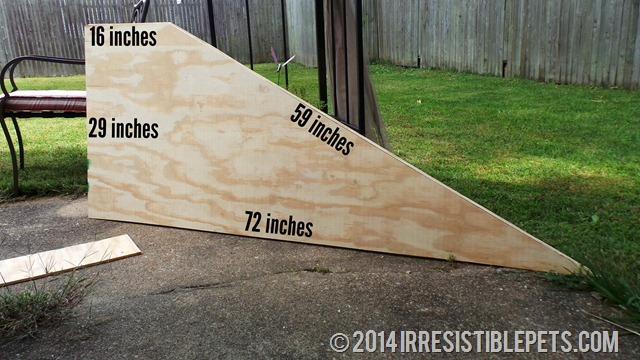 Here is a visual of the angled sides to help illustrate the dimensions. Once everything is measured, start cutting out the pieces using a Circular Saw. Don’t put the saw away just yet! 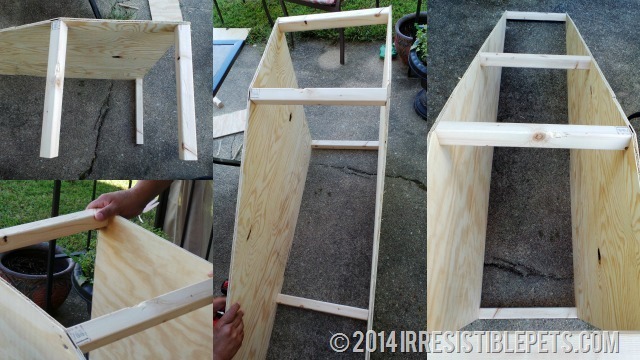 You’ll need to cut out the support beams to keep all of the plywood pieces together. We used about 8 beams, placed along the top and bottom of the ramp. Use a power drill and screws to put the support beams in place. If you prefer, you can use nails and a hammer. After you’ve put all the support beams in, use the power drill to place the top of the ramp, the platform, and the back together to close up the ramp. Once everything is put together, check the sturdiness. When we first did this, it was a little shaky, so we added more support beams inside. I recommend painting the ramp before applying the carpet. We did the carpet first which made it really challenging to paint the sides close to the carpet. Learn from my mistake! 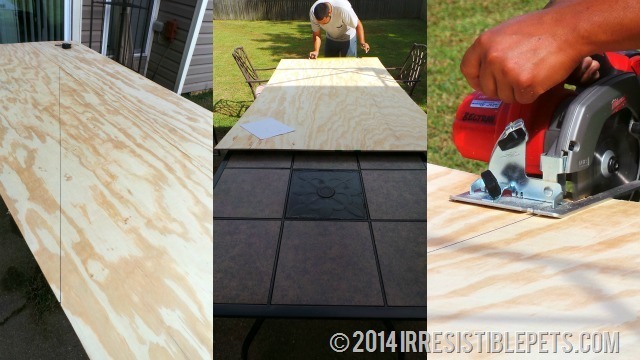 Start by sanding down the plywood to soften the wood. 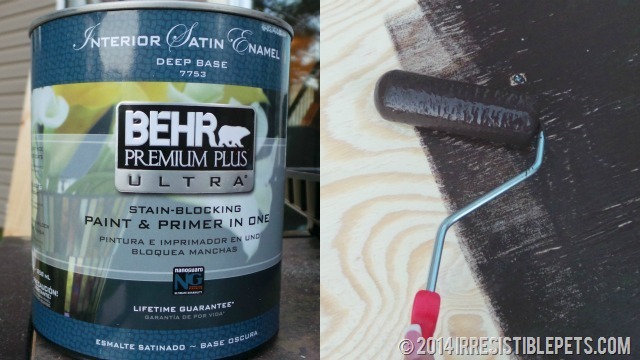 Paint the ramp the color of your choice using a paint + primer in one to save some time. We used Behr Premium Plus Ultra in Sweet Molasses. Once the paint dries, it’s time to place the carpet on the ramp and platform. I had some left over carpet from when we moved into our home that worked perfectly with the amount needed for the ramp. 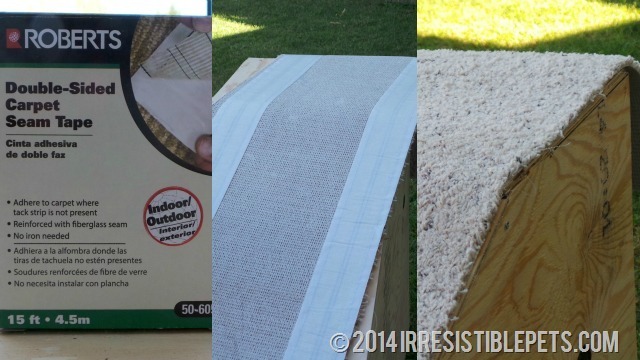 Adhere the carpet to the wood using Roberts Double Sided Carpet Seam Tape. The easy part is done! The challenge begins when you start training your dog to use the ramp. Chuy picked it up pretty quick but occasionally he gets on and off incorrectly and tries to jump. 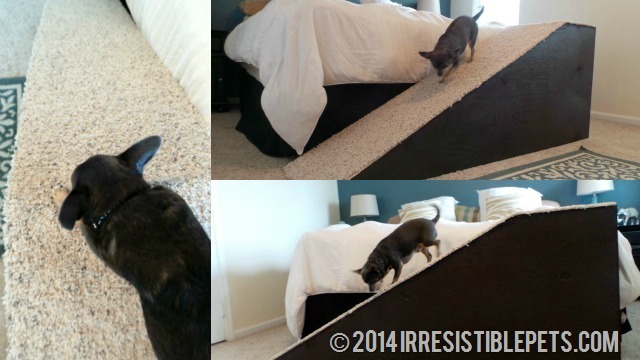 If you are interested in ramp training tips, check out our post How to Train Your Small Dog to Use a Ramp. 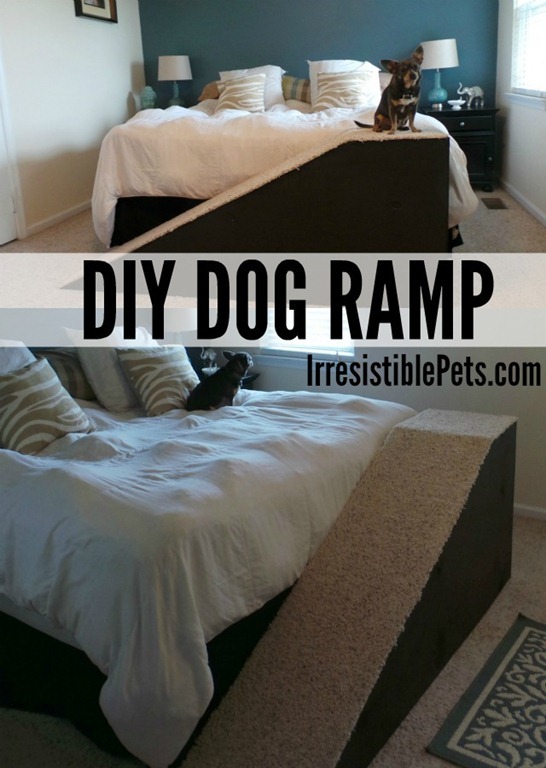 For more ideas like this DIY Dog Ramp, be sure to stop by our DIY Pet Project Gallery! That turned out really good! I love how it fits so well with your bedroom decor. I hope Chuy is feeling better! Loo0ks great and such easy to follow instruction. Sharing. That is so cool – I love it. I have a friend whose little girl Piper could really benefit from this. I will forward your post to her. Thanks so much for sharing, you did an excellent job. LOVE LOVE LOVE, your doggie ramp! I built one today, thanks so much!!! This looks great. Can you post on training to use the ramp? I am actually going to build the ramp for my 14 year old kitty. She has some medical issues and it is hard for her to jump on and off the bed. Then of course I have issues that involve not being able to sleep without her in my bed! So doggie ramp here we come!!! I also wanted to mention there is some great storage under the ramp if it is going to be immobile. I will let you know how it turns out! That’s great! I can’t wait to hear all about it! I also have a little dog that suffers from IVDD. And one of my other babies is at the vet about to have a leg amputated after being hit by a car. Thank you for these instructions. I will be building a couple of these this weekend! I know my boys will appreciate it! Sorry to hear that about your baby. Sending you lots of positive vibes for a quick recovery. Glad to hear this will help you. Wonderful idea! Will come in handy with my Bassett. Could you post info on training to use the ramp? Thanks so much! Great plans. But how do I print out the directions? When I tried to print all that printed was the ads & pictures on the right side directions & pictures did nor print> Need to build one of these. My Sisco had to have his spine decompressed & disc fragments removed. Still confined to his apartment at least till 4-15-16 when we see see the doctor & hope he will be released to go out by himself. Will be waiting to back from you. This is the best ramp I have seen sofa. So sorry to hear about your Sisco. I’m sending you healing thoughts and prayers. This ramp has been a life saver for my Chuy and his IVDD. I hope that it brings you as much joy for Sisco! Glad to hear you were able to get this printed. Please reach out if you have any questions. 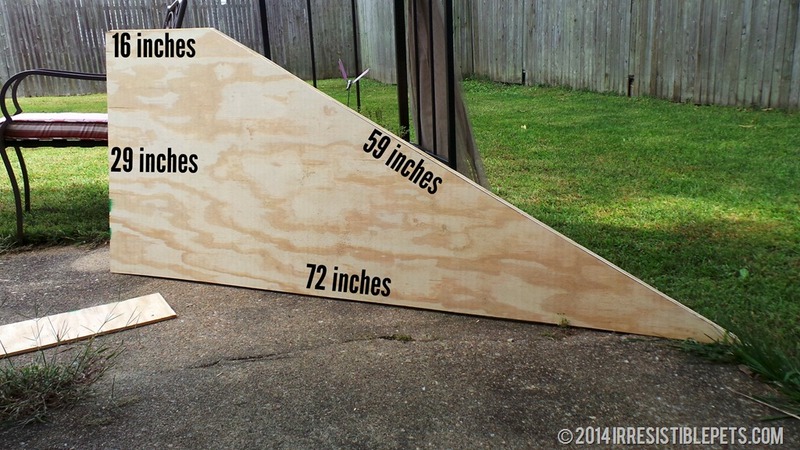 Did you use 2 pieces of 4×8 plywood? Definitely making these for my dog who has hip dysplasia! Just one piece that we cut to make both sides of thee ramp. Hope this helps! Looks great! I’m wanting to make one for my dog who has a hard time jumping on higher beds. I was wondering about how much the finish project weighs? Thanks for the tutorial! Thank you! It’s not too heavy and is pretty easy to move around the room. Not sure the exact weight though. I’m assuming your supplies list is wrong or I’m not figuring this out correctly as I can’t seem to fit all pieces on one sheet, did you use two 4×8 sheets in order to get the sides and ramp? Would like to know how to train dog to use ramp. I love your design and I plan on making it next week for my dachshund. However, when applied the Pythagorean theorem to your measurement blueprint for the sides I came up with a number different than what you listed for upright vertical number. I may just have been out of school for too long. A squared plus C squared does not equal B squared. But, are you sure you’re measurements are correct for the side pieces? This is just what I need for my little oldies to safely get on the bed. At the moment we have store bought steps and they come a bit short to our high bed. Making this to fit is the perfect solution. Thank you from all my doggie kids from downunder in Australia! Glad to hear this could help! Hello to you all in Australia! First of all let me commend your husband for his most excellent ramp design and choice of wives. Now with that said I would like to add that the statement “One 4X8 sheet of Plywood (at least 3/4 inch thickness)” could use some additional detail. While 3/4″ might be needed for a Great Dane not every one sleeps with a Great Dane. 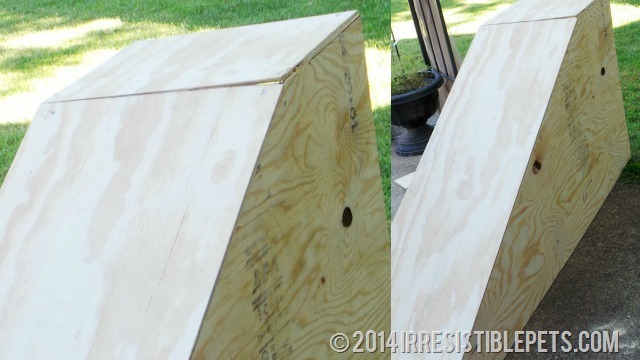 Smaller dogs or cats might get by with thinner plywood. The design is the best I have found both DIY or to buy and I do intend to build one for our two little guys. Thanks to your wonderful efforts. Thank you so much for this idea! We have a 10 year old black lab, who was hit by a car last year, and has arthritis now in the leg she injured. I am a boring insurance underwriter while my husband has a contracting company, and I actually impressed him with my DIY project find and blueprint! The instructions were very easy to follow. My measurements were slightly different to fit our space (65″ L x 25″ H) and the 4×8 sheet was perfect. • Used thicker wood to support her big beautiful self. 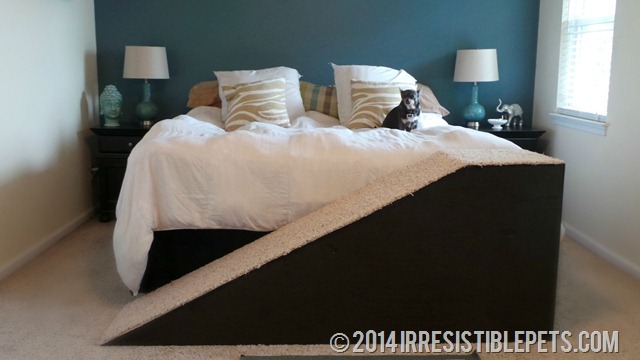 • One side is against a wall and another at the foot of the bed, so we extended the width of the ramp to 18″ in. and stapled the carpet over the edges to avoid scuff marks. • Spaced out 4 strips of wood across the ramp to give her legs extra traction. I just noticed your tips on how to get her to use this new addition… very helpful!! Can’t wait to try this, exactly what I was looking for. Think it will work with a large dog- 60-70 lbs? Thanks! Awesome! This one is built for a small dog like a Chihuahua. For a larger dog, I’m not sure. Also, make sure that it will be wide enough. My daughter who is almost 30 lbs uses it as a slide LOL. How wide is the ramp?